Ever since its long-term low at 1.0462, which was formed nearly a year and a half ago, the euro has been moving in a clearly converging range, despite the rising momentum on the weekly chart. The daily chart has witnessed more lively action, at least in comparison to the weekly, but price is still all over the place and the market doesn’t seem to have a clear direction just yet. This week we offer two daily counts, both of which expect this consolidation to be at an end. On one hand, the main count anticipates a couple more weeks before the triangle is fully complete, since its final wave is quite short in time in relation to its other waves. Within black wave (B), blue wave D formed a zigzag labeled pink waves a, b and c, retracing a little over 61.8% of blue wave C and reaching a little than 61.8% the length of blue wave B. Blue wave E is forming a double zigzag labeled pink waves w, x and y. Within it, pink wave w formed a zigzag labeled green waves (a), (b) and (c). It’s either complete or very near completion. 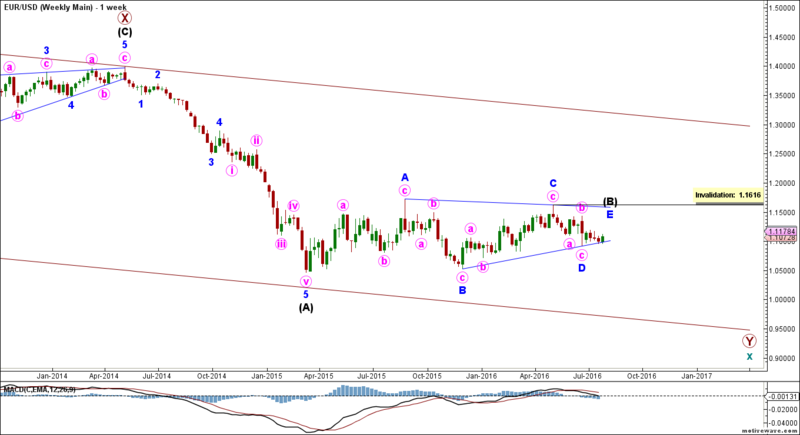 This count expects the euro first to move sideways or downwards in pink wave x before reversing towards the upside in pink wave y to complete blue wave E of black wave (B). This will be supported by movement above 1.1200. This wave count is invalidated by movement above 1.1616 as blue wave E of a contracting triangle may not move beyond the start of blue wave D. It’s also invalidated by movement below 1.0913 as pink wave x of a double zigzag may not move beyond the start of pink wave w.
This alternate count sees that blue wave E is already complete or very near completion, having formed a simple and relatively short zigzag labeled pink waves a, b and c.
Within it, pink wave c almost reached 100% the length of pink wave a. It’s either complete or very near completion. This count expects the euro finally to resume moving towards the downside in black wave (C) to complete maroon wave Y of teal wave x. This will be largely confirmed by movement below 1.0913. At 0.9118 black wave (C) would reach 61.8% the length of black wave (A), then at 0.7769 it would reach 100% of its length. This wave count is invalidated by movement above 1.1616 as blue wave E of a contracting triangle may not move beyond the start of blue wave D. Once price reaches our confirmation point, we may lower the invalidation point to the end of black wave (B), which currently stands at 1.1198. In our previous analysis Cable unfolded as expected inline with the main count and first target was reached and exceeded. As always we will be approaching Cable`s analysis systematically one step at a time. We will be setting specific points -confirmation points- that when reached, a certain count`s probabilities increases and we follow that count. Therefore, we are updating the main count according to the latest price action and as well adding two alternate counts. The first alternate count expects that downwards correction has one more low to offer before reversing directions and moving upwards. The second alternate count expects that upwards correction is complete and that a downwards motive wave is underway. For further clarifications, please watch the video analysis below. Elliott Wave chart analysis for the GBPUSD for 25th July, 2016. Please click on the charts below to enlarge. within wave 3 blue, the main count expects that wave i pink is complete and that wave ii pink is unfolding upwards as a zigzag correction labeled waves (a), (b) and (c) green with waves (a) and (b) green complete and wave (c) green is unfolding upwards. At 1.3491 wave (c) green would reach 0.618 of wave (a) green and at 1.3643 wave ii pink would reach 0.382 of wave i pink and finally at 1.3753 wave (c) green would reach equality with wave (a) green. This count would be invalidated by movement above 1.5020 as wave ii pink may not retrace more than 100 % of wave i pink and as well this count would be invalidated by movement below 1.2794 as within wave ii pink wave (b) green may not retrace more than 100 % of wave (a) green. The first alternate count expects that wave (b) green has more to offer downwards before reversing directions and moving upwards within wave (c) green. Within wave (b) green it is expected that waves a and b orange are complete and that wave c orange has started unfolding downwards. 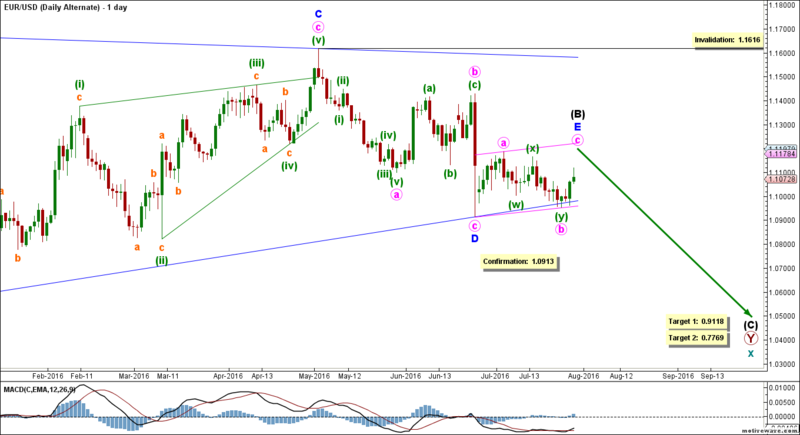 This count would be confirmed by movement below 1.3071. At 1.3022 wave c orange would reach 0.786 of wave a orange and we have a target zone that starts at 1.2950 as at that level wave (b) green would reach 0.786 of wave (a) green and the target zone ends at 1.3946 as at that level wave c orange would reach equality with wave a orange. This count would be invalidated by movement above 1.3481 as wave b orange within wave (b) green may not retrace more than 100 % of wave a orange as well this count would be invalidated by movement below 1.2794 as within wave ii pink wave (b) green may not retrace more than 100 % of wave (a) green. The difference between both main and second alternate counts is within the subdivisions of wave ii pink as this count expects that wave ii pink is complete and that wave iii pink is at its very early stages. It should be noted that this count is considered an alternate count as it does not provide the best fit. Wave ii pink unfolded as a zigzag labeled waves (a), (b) and (c) green. Within wave iii pink waves (i) and (ii) green are likely complete and wave (iii) green is unfolding downwards. This count would be confirmed by movement below 1.2794. 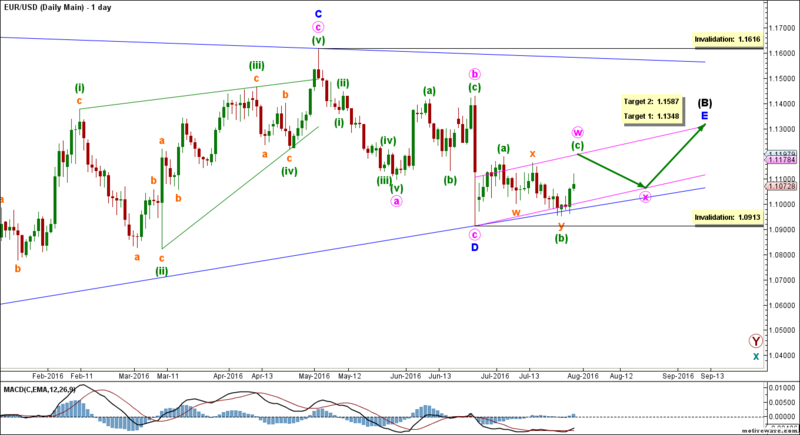 At 1.2748 wave (iii) green would reach 1.618 of wave (i) green. This count would be invalidated by movement above 1.3481 as wave (ii) green may not retrace more than 100 % of wave (i) green and it is worth noting that the invalidation point would be moved to the end of wave (ii) green once we have confirmation on the hourly chart that wave (iii) green is unfolding downwards.